Image Registration is the process of aligning images to make features align accurately. Images are registered for the purpose of combining or comparing them, merging RGB channels, or to increase the Signal to Noise ratio. 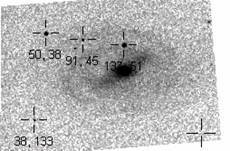 Registration is also an essential step when searching images for transient features and new objects. Mira gives true sub-pixel registration that is unmatched in the quality of the result and ease of use. Truly exceptional results are remarkably simple to obtain. The quality of image registration varies from one piece of software to another. 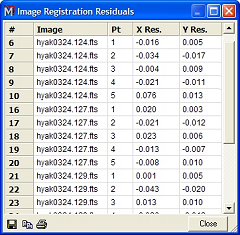 Users of multiple software packages repeatedly attest to the superior results obtained using Mira. Using Mira, can register any number of images of any size, manually or with some automation, and can handle anything from simple offsets to field rotation, non-square pixels, differing image size and scale, and even non-perpendicular axes. So, if your colleague in Timbuktu sends you images taken with a totally different CCD camera, using a different size telescope, and they're rotated 150 degrees and reversed left/right compared with yours, Mira will handle it. A few minutes of processing in Mira and you will have an image set in perfect alignment that you can blink or animate to compare their quality, search for transients, combine for higher signal to noise ratio, or whatever! This degree of capability combined with ease of use is something you see everywhere in Mira. Although accurate image registration is critical requirement in many types of imaging applications, an example from astronomy illustrates Mira's capabilities very well. A typical problem in astronomy often arises when a telescope does not track well enough to produce sharp images with round stars on long exposures. Yet a long exposure may be required to show to show faint objects or to increase the precision of a measurement to an acceptable level. A long exposure can be synthesized by stacking many shorter exposures in software. However, the images in separate exposures are usually misaligned because of telescope tracking anomalies. The solution is to acquire many images, then register them after calibration but before combining to make an equivalent single, long exposure image. Here we show an example of how many short exposures — each of which is virtually worthless--can be combined to produce a usable result. These images were taken through a telescope that tracked very poorly because it was not well aligned with the celestial pole, thus causing field rotation and smeared images. After some experimentation, it was determined that an exposure as long as 30 seconds could be obtained without showing unacceptably elongated stars. Unfortunately, the Signal to Noise ratio of one 30 second image was very poor, thanks to the bright urban sky. Therefore, an exposure long enough to show faint details in this galaxy simply was not an option if the stars were to appear round. The solution was to acquire a number of short 30 second exposures, then register and combine them. Mira's unique image set architecture, efficient image registration and powerful image combining tools turned this hopeless situation into a result that was simply impossible otherwise. For the processing shown below, Mr. Ray Gralak acquired a series of 30 images of 30 seconds each. The images were opened as an image set and processed to remove CCD artifacts, then registered and combined in Mira. The result shows something very close to what he might have been achieved in a single exposure, had the telescope been able to track sufficiently well. They have been displayed in negative so that you can see the noise and its improvement by the registration and combining processes. Single image showing 4 marked registration points. Note the low S/N of the single image. This image is registered but not combined. Image set combined without registration. There is little gain in S/N over that of 1 image because the unregistered features do not reinforce. Combined image set after registration using the Shift method when the Shear method should have been used. Note residual field rotation among stars in the upper left part of the image. Median combined image set showing good registration using the Shear method. Note the S/N improvement compared with the single image at the upper left. Mira makes it easy to register any number of images simply by clicking the mouse a few times. If the images contain point sources, Mira can centroid and track the points through the images. Mira can compensate images for shift, rotation, scale differences, non-square image pixels, and non-perpendicular column and row axes. The RMS error of the transformation may be only a few hundredths of a pixel in each direction, meaning that the resulting images should align virtually perfectly — as well as if they came from a single image. Image registration uses Mira's Animation capability to register an image stack. The image shown here is the top image of a stack of 5, 1040x1024 32-bit real images. The entire registration procedure is operated from the toolbar shown on the left side of the image window. Just a few clicks of the mouse can usually suffice to fully register a stack of images. Clicking the "calculate" button takes the data for all reference points and cranks out the transformation equations needed to perfectly register the images. The results are shown in the window below. Mira lists the calculated transformation equation coefficients in an editor window as shown at left. These can be used to assess the quality of the alignment after the transformation equations are applied as the last step of the image registration process. The values "x rms" and "y rms" give the uncertainty, measured in pixels for the computed transformation using the reference points you have chosen. The final error you can expect is a small bit larger because the re-sampling process will convert random errors in the pixel intensity into random errors of position. To assess the quality of alignment in the registered images, we measured the centroid positions of 5 arbitrarily chosen stars in each of the 4 images. The result was an RMS random error of 0.04 pixels. Since there is uncertainty (random error) built into any centroiding algorithm, the measured RMS error includes both the random errors of the image registration and the random errors of the centroid measurement, added in quadrature. 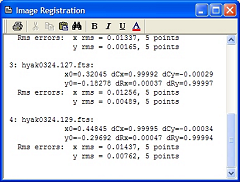 Even a "perfect" centroid measurement contains random errors of position that arise from the random errors in the pixel intensities used by the calculation. Thus a measured RMS error of 1/25 pixel is tiny indeed! Results this good attest not only to Mira's registration and re-sampling tools, but also to the accuracy of Mira's centroiding algorithm.